Info "Get the pikmin to the nectar." Pikmin is one of 9-Volt's microgames in localized versions of WarioWare: D.I.Y. 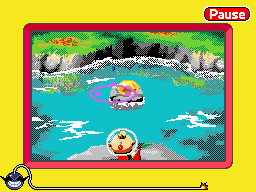 Since the microgame Murasamejō from the Japanese version is based off a Japan-only game, Nazo no Murasame Jō, all non-Japanese releases of the game replace Murasamejō with the Pikmin microgame. The microgame is based on the video game Pikmin. The player controls Captain Olimar holding a Red Pikmin. The point of the game is to throw the Pikmin onto the rock that contains nectar. The player needs to tap the screen when the cursor is over the rock. If the Pikmin lands on the nectar and drinks it, the game is won. However, if time runs out or if the Pikmin is accidentally thrown into the water, the game ends in a loss. This page was last edited on October 1, 2018, at 14:52.